Hormizd IV (Middle Persian: 𐭠𐭥𐭧𐭥𐭬𐭦𐭣‎; New Persian: هرمز چهارم), was king (shah) of the Sasanian Empire from 579 to 590. He was the son and successor of Khosrow I. During his reign, Hormizd IV had the high aristocracy and Zoroastrian priesthood slaughtered, whilst supporting the landed gentry (the dehqan). His general, Bahram Chobin, successfully contained defeated a massive Turkic incursion in the east, and as a result became subject of jealousy, which led to Hormizd IV have him disgraced and dismissed. Bahram, infuriated by Hormizd's actions, responded by rebelling, and due to his noble status and great military knowledge, was joined by his soldiers and many others. Two other dissatisfied nobles, Vistahm and Vinduyih, shortly had Hormizd IV deposed and killed, elevating his son Khosrow II as the new shah. The name of Hormizd (also spelled Ōhrmazd, Hormozd) is the Middle Persian version of the name of the supreme deity in Zoroastrianism, known in Avestan as Ahura Mazda. The Old Persian equivalent is Auramazdā, while the Greek transliteration is Hormisdas. Hormizd IV is called a Torkzad(a) in the Shahnameh, meaning son of a Turk, according to some sources his mother was the daughter of the Turkish khagan, this, however, has been rejected by Encyclopædia Iranica, which states that the marriage with the daughter of the Turkish khagan is impossible, and says that Hormizd was born in 540, thirty years before Khosrow's marriage. His mother was in reality most likely the daughter of the khagan of the Khazars. Khosrow I had appointed Hormizd IV as his heir since he was aware that Hormizd had showed himself as qualified leader. Hormizd IV came to the throne in 579, he seems to have been imperious and violent, but not without some kindness of heart. Some very characteristic stories are told of him by al-Tabari. His father's sympathies had been with the nobles and the priests. Hormizd IV protected the common people and introduced a severe discipline in his army and court. When the priests demanded a persecution of the Christians, he declined on the ground that the throne and the government could only be safe if it gained the goodwill of both concurring religions. The consequence was that Hormizd IV raised a strong opposition in the ruling classes, which led to many executions and confiscations. These even included the famous Karenid vizier of his father, Bozorgmehr; the latter's brother Simah-i Burzin; the Mihranid Izadgushasp; the spahbed Bahram-i Mah Adhar, and the Ispahbudhan Shapur, who was the father of Vistahm and Vinduyih. According to al-Tabari, Hormizd is said to have ordered the death of 13,600 nobles and religious members. When Bacurius III of Iberia died in 580, Hormizd IV quickly took the opportunity and replaced the monarchy in Iberia with a Sasanian governor. The reason for this was because the native rulers of Iberia had caused much trouble to the Sasanians. From his father, Hormizd had inherited an ongoing war against the East Roman (Byzantine) Empire and against the Turks in the east. Negotiations of peace had just begun with the Emperor Tiberius II, but Hormizd IV haughtily declined to cede anything of the conquests of his father. Therefore the accounts given of him by the Byzantine authors, Theophylact Simocatta (iii.16 ff), Menander Protector and John of Ephesus (vi.22), who give a full account of these negotiations, are far from favourable. Map of the Roman-Sasanian frontier in Late Antiquity. 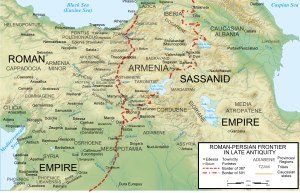 Determined to teach the Sasanian king a lesson, the Roman General Maurice crossed the frontier and invaded Kurdistan. The next year, he even planned to penetrate into Media and Southern Mesopotamia but the Ghassanid king al-Mundhir allegedly betrayed the Roman cause by informing Hormizd IV of the Roman Emperor's plans. Maurice was forced to retreat in a hurry, but during the course of his retreat to the Roman frontier, he drew the Persian general Adarmahan into an engagement and defeated him. In 582, the Sasanian general Tamkhosrau crossed the Perso-Roman frontier and attacked Constantina, but was defeated and killed. However, the deteriorating physical condition of the Roman Emperor Tiberius II forced Maurice to return to Constantinople immediately. Meanwhile John Mystacon, who had replaced Maurice, attacked the Sasanians at the junction of the Nymphius and the Tigris but was defeated and forced to withdraw. Another defeat brought about his replacement by Philippicus. Philippicus spent the years 584 and 585 making deep incursions into Iranian territory. The Iranians retaliated by attacking Monocartium and Martyropolis in 585. Philippicus inflicted a heavy defeat on them at Solachon in 586 and besieged the fortress of Chlomaron. After an unsuccessful siege, Philippicus retreated and made a stand at Amida. Soon, however, he relinquished command to Heraclius in 587. In the year 588, the Roman troops mutinied and taking advantage of this mutiny, Sasanian troops once again attacked Constantina but were repulsed. The Romans retaliated with an equally unsuccessful invasion of Arzanene, but defeated another Sasanian offensive at Martyropolis. In 589, the Sasanians attacked Martyropolis and captured it after defeating Philippicus twice. Philippicus was recalled and was replaced by Comentiolus under whose command the Romans defeated the Sasanians at Sisauranon. The Romans now laid siege to Martyropolis but at the height of the siege news circulated in Iran about a Turkic invasion. Bahram Chobin fighting Bagha Qaghan. In 588, the Sasanian Empire was in chaos; The Arabs had started pillaging the western provinces, while the Khazars ravaged the northern provinces, and now the Turks had occupied Balkh and were penetrating into the heart of Iran. Hormizd IV, under the advice of Nastuh, called upon father of the latter, who was named Mihransitad. According to Ferdowsi, Mihransitad told the Sasanian king that the astrologers had predicted that a certain Bahram Chobin would be the savior of Iran. He then suggested that Bahram Chobin should be summoned to the Sasanian court. The aged Mihransitad is said to have immediately died after that. Hormizd did as he advised and finally dispatched a contingent under the general Bahram Chobin to fight them back. Bahram's army supposedly consisted of 12,000 hand-picked horsemen. His army ambushed a large army of Turks and Hephthalites in April 588, at the battle of Hyrcanian rock, and again in 589, re-conquering Balkh, where Bahram captured the Turkic treasury and the golden throne of the Khagan. He then proceeded to cross the Oxus river and won a decisive victory over Turks, personally killing Bagha Qaghan with an arrowshot. He managed to reach as far as Baykand, near Bukhara, and also contain an attack by the son of the deceased Khagan, Birmudha, whom Bahram had captured and sent to the Sasanian capital of Ctesiphon. Birmudha was well received there by Hormizd, who forty days later had him sent back to Bahram with the order that the Turkic prince should get sent back to Transoxiana. The Sasanians now held suzerainty over the Sogdian cities of Chach and Samarkand, where Hormizd minted coins. [a] After Bahram's great victory against the Turks he was sent to Caucasus to repel an invasion of nomads, possibly the Khazars, where he was victorious. He was later made commander of the Sasanian forces against the Byzantines once again, and successfully defeated a Byzantine force in Georgia. However, he afterwards suffered a minor defeat by a Byzantine army on the banks of the Aras. Hormizd, who was jealous of Bahram, used this defeat as an excuse to dismiss him from his office, and had him humiliated. According to another source, Bahram was the subject of jealousy after his victory against the Turks. Hormizd's minister Azen Gushnasp, who was reportedly jealous of Bahram, accused him of having kept the best part of the booty for himself and only sending a small part to Hormizd. According to other sources, however, it was Birmudha or the courtiers that raised Hormizd's suspicion. Regardless, Hormizd could not tolerate the rising fame of Bahram, and thus had him disgraced and removed from the Sasanian office for supposedly having kept some of the booty for himself. Furthermore, Hormizd also sent him a chain and a spindle to show that he considered him as a lowly slave "as ungrateful as a woman". Enraged, Bahram, who was still in the east, rebelled against Hormizd. The version of Bahram rebelling after his defeat against the Byzantines was supported by Nöldeke in 1879. However, a source found ten years later confirmed Bahram's rebellion took in fact place while he was still in the east. Bahram, infuriated by Hormizd's actions, responded by rebelling, and due to his noble status and great military knowledge, was joined by his soldiers and many others. He then appointed a new governor for Khorasan, and afterwards set for Ctesiphon. Azen Gushnasp was sent to suppress to the rebellion, but was murdered in Hamadan by one of his own men, Zadespras. Another force under Sarames the Elder was also sent to stop Bahram, who defeated him and had him trampled to death by elephants. Meanwhile, Hormizd tried to come to terms with his brothers-in-law Vistahm and Vinduyih, "who equally hated Hormizd". Hormizd shortly had Vinduyih imprisoned, while Vistahm managed to flee from the court. After a short period of time, a palace coup under the two brothers occurred in Ctesiphon, which resulted in the blinding of Hormizd and the accession of the latter's oldest son Khosrow II (who was their nephew through his mother's side). The two brothers shortly had Hormizd killed. Nevertheless, Bahram continued his march to Ctesiphon, now with the pretext of claiming to avenge Hormizd. ^ The Sasanians only managed to retain Chach and Samarkand for a few years, until it was re-captured by the Turks, who seemingly also conquered the eastern Sasanian province of Kadagistan. ^ Vevaina & Canepa 2018, p. 1110. ^ a b c Shahbazi 2004, pp. 466-467. ^ Khaleghi Motlagh, Djalal (1990). "BOZORGMEHR-E BOḴTAGĀN". Encyclopaedia Iranica. Vol. 4. ^ Edwards, Iorwerth Eiddon Stephen (1970). The Cambridge Ancient History. Cambridge University Press. p. 102. ISBN 0-521-32591-9. ^ a b c d e f Shahbazi 1988, pp. 514–522. ^ Jaques 2007, p. 463. ^ a b c d e f Rezakhani 2017, p. 178. ^ Litvinsky & Dani 1996, pp. 368-369. ^ Martindale, Jones & Morris 1992, p. 167. ^ a b Shahbazi 1988, pp. 514-522. ^ a b Tafazzoli 1988, p. 260. Martindale, John Robert; Jones, Arnold Hugh Martin; Morris, J., eds. (1992). The Prosopography of the Later Roman Empire, Volume III: A.D. 527–641. Cambridge: Cambridge University Press. ISBN 978-0-521-20160-5. Shahbazi, A. Shapur (2004). "HORMOZD IV". Encyclopaedia Iranica, Vol. XII, Fasc. 5. pp. 466–467. Rezakhani, Khodadad (2017). ReOrienting the Sasanians: East Iran in Late Antiquity. Edinburgh University Press. pp. 1–256. ISBN 9781474400305. Howard-Johnston, James (2010). "ḴOSROW II". Encyclopaedia Iranica, Online Edition. Retrieved 27 February 2016. Crawford, Peter (2013). The War of the Three Gods: Romans, Persians and the Rise of Islam. Pen and Sword. ISBN 9781848846128. Rawlinson, George (2004). The Seven Great Monarchies of the Ancient Eastern World. Gorgias Press LLC. ISBN 9781593331719. Foss, Clive (1975). The Persians in Asia Minor and the End of Antiquity. The English Historical Review. 90. Oxford University Press. pp. 721–47. doi:10.1093/ehr/XC.CCCLVII.721. Oman, Charles (1893). Europe, 476-918, Volume 1. Macmillan. Potts, Daniel T. (2014). Nomadism in Iran: From Antiquity to the Modern Era. London and New York: Oxford University Press. pp. 1–558. ISBN 9780199330799. Warren, Soward. Theophylact Simocatta and the Persians (PDF). Sasanika. Jaques, Tony (2007). Dictionary of Battles and Sieges: F-O. Greenwood Publishing Group. pp. 1–1354. ISBN 9780313335389. Shahbazi, A. Sh. (1988). "Bahrām VI Čōbīn". Encyclopaedia Iranica, Vol. III, Fasc. 5. London et al. pp. 514–522. Litvinsky, B. A.; Dani, Ahmad Hasan (1996). History of Civilizations of Central Asia: The crossroads of civilizations, A.D. 250 to 750. UNESCO. pp. 1–569. ISBN 9789231032110. Shayegan, M. Rahim (2004). "Hormozd I". Encyclopaedia Iranica, Vol. XII, Fasc. 5. pp. 462–464. Vevaina, Yuhan; Canepa, Matthew (2018). "Ohrmazd". In Nicholson, Oliver (ed.). The Oxford Dictionary of Late Antiquity. Oxford: Oxford University Press. ISBN 978-0-19-866277-8. This page was last edited on 23 April 2019, at 20:05 (UTC).